INTRODUCTION: Individuals with Body Dysmorphic Disorder (BDD) may seek cosmetic surgery to correct a perceived defect. BDD prevalences ranging from 6% to 24% and up to 53% have been reported among cosmetic surgery patients. Recent studies have been conducted to identify the pathophysiology of BDD symptoms using neuroimaging, as well as the relationship of BDD to other disorders (e.g., obsessive-compulsive disorder, anorexia nervosa, social anxiety, and somatization disorder), and means to distinguish delusional from non-delusional beliefs as an expression of a single mental disorder at different severity levels. Retrospective studies have however suggested that BDD patients do not benefit from cosmetic surgery. This paper aimed at providing an overview of the current research on BDD and identifying psychopathological characteristics of BDD in cosmetic surgery patients. METHODS: The PubMed and Embase databases were searched by crossing the keywords "plastic surgery", "aesthetic surgery" and "body dysmorphic disorder". RESULTS: The prevalence of BDD was high among cosmetic surgery patients. No prospective studies were found on the impact of cosmetic surgery on BDD patients. CONCLUSION: BDD needs to be adequately assessed during patient selection for cosmetic surgery to optimize the quality of care provided and the quality of life of patients with BDD. INTRODUÇÃO: Indivíduos com Transtorno Dismórfico Corporal (TDC) buscam a cirurgia estética para corrigir um defeito percebido. A prevalência de TDC entre pacientes de cirurgia plástica varia de 6% a 24%, podendo chegar a 53%. Recentemente, estudos foram realizados para identificar a fisiopatologia dos sintomas de TDC através de neuroimagem, assim como a relação entre TDC e outros transtornos (por exemplo, transtorno obsessivo-compulsivo, anorexia nervosa, ansiedade social, e transtorno de somatização), e para distinguir convicções delirantes de não-delirantes como uma expressão de um único transtorno mental com diferentes níveis de gravidade. Entretanto, estudos retrospectivos sugerem que pacientes com TDC não se beneficiam com cirurgia plástica. O objetivo deste artigo foi fornecer uma visão geral da pesquisa atual sobre TDC e identificar características psicopatológicas do TDC em pacientes de cirurgia plástica. MÉTODO: Realizou-se uma busca nas bases de dados PubMed e Embase cruzando as palavas-chave "cirurgia plástica" "cirurgia estética" e "transtorno dismórfico corporal". RESULTADOS: A prevalência de TDC é alta entre pacientes de cirurgia plástica. Não há estudos prospectivos sobre o impacto da cirurgia plástica em pacientes com TDC. CONCLUSÃO: TDC precisa ser adequadamente identificado na seleção de pacientes para cirurgia plástica a fim de otimizar a gestão de atendimento e a qualidade de vida de pacientes com TDC. Most patients with body dysmorphic disorder (BDD) first seek treatment from plastic surgeons instead of psychiatrists or psychologists because they are distressed by their perceived physical defect and do not believe that they have a mental disorder. These patients are viewed by their families and friends as vain and as a reflection of a society more and more concerned with appearance. Usually, patients are recognized by plastic surgeons as having a psychological problem after taking a long time trying to show an inexistent or small cosmetic problem during a consultation. The plastic surgeon may be tempted to tell these patients that their physical problems are mild or inexistent, that cosmetic surgery is contraindicated in their cases, and send them home. However, the plastic surgeon should instead refer these patients to psychological treatment; otherwise, these patients will look for other plastic surgeons, who will eventually operate on them. Some patients with mild BDD may benefit from cosmetic surgery, but BDD patients are often dissatisfied with the surgical outcome. Through this review, plastic surgeons will have a different perspective on the suffering and distress experienced by patients with BDD and will be able to face these patients differently after reading the article. Standards of beauty help to shape thoughts, which on the one hand lead to an increased demand for plastic surgery, and on the other to a discrepancy between what is conceived as ideal and the actual personal reality. Thus, the demand for cosmetic procedures may be an adaptive strategy in a culture that values physical appearance1. It has already been demonstrated that patients benefit from cosmetic surgery with improvement of quality of life, self-esteem, and self-image2. However, the perception of a defect or flaw in the physical appearance may contribute to the development of a mental disorder in individuals with neurobiological vulnerability and psychological fragility. This occurs when not only body dissatisfaction but also body dysmorphic disorder (BDD) is present3. Thus, an excessive concern with appearance can conceal psychopathological traits that are not always easy to recognize and may result in iatrogenic and medico-legal problems if neglected4. BDD is one of the most common psychiatric conditions found in patients seeking cosmetic surgery5. Although BDD is a common mental disorder, its prevalence in different populations indicates that BDD symptoms still defies identification in medical practice. As a consequence of the growing number of individuals seeking cosmetic surgery, most cases of BDD will be seen by plastic surgeons and not by psychiatrists6,7. For this reason, it is important to develop instruments to identify BDD symptoms among patients and ascertain whether cosmetic surgery would be contraindicated for this population7. In addition, cosmetic surgery is an appropriate area to study body image, and body image dissatisfaction is an essential feature of BDD. The purpose of this study was to emphasize the importance of promptly identifying patients with BDD, and therefore, important aspects of BDD were addressed. BDD is a phenomenon that has been observed in different periods and cultures, and although it seems to be a contemporary topic, it was first described as 'dysmorphophobia' by Enrico Morselli in 18868. Just over 20 years ago BDD was included as a diagnostic category along with other major psychiatric classifications9. Its diagnosis was only possible when the body became the main focus of attention, resulting in a social phenomenon3,10. The first studies emerged in the scientific literature concerning the psychiatric aspects of BDD in cosmetic surgery11,12. However, the use of a heterogeneous methodology characterized by case reports and non-standardized interviews in small case series precluded the generalization of findings3. In addition, the weakness of studies on psychiatric practice, using retrospective data with possible bias in the selection of patients, have resulted in shortcomings in the identification and treatment of BDD13.Cansever et al.14 further contended that the influence of differences in social and cultural standards and values on prevalence rates of BDD might affect the analysis and applicability of results. BDD is categorized as a neuropsychiatric disorder involving biological factors, such as genetic vulnerability and neurochemical dysfunction15, as well as aspects of the patient's personal history16. There have been advances in the understanding of changes that occur in the brain anatomy of these patients. Neuroimaging studies have allowed the observation of brain activation during the processing of visual and emotional stimuli and body image perception15. Feusner et al.15 reported that lesions in specific regions of the brain may cause dysfunctions in several brain networks and functioning circuits related to the pathophysiology of BDD, resulting in BDD symptoms and neurocognitive deficits. The knowledge of the etiology of BDD contributes to its diagnosis, to the differentiation of BDD from other mental disorders (such as the mood, anxiety, eating, impulse control, and sexual and gender identity disorders)15,17, to the understanding of the dynamics of patient behavior, and to the development of treatment strategies for optimization of results. Fontenelle et al.10 highlighted the importance and influence of sociocultural factors and their role in the etiology of BDD, and suggested the need for systematic investigations to identify how cultural aspects would affect the phenomenology of preoccupation with physical appearance in BDD patients. Moreover, Veale18 pointed out that, in a culture that values appearance, increased levels of preoccupation with body image based on an ideal body model may stimulate individuals to seek cosmetic surgery. Dissatisfaction and preoccupation with body image are a common and normal condition in the general population. However, the difference between normal preoccupation and BDD can be a matter of degree9; BDD is an extreme on a continuum of preoccupation with physical appearance and quantitatively more severe than normal preoccupation6. Prevalence studies have indicated that about 1% to 6% of the general population have BDD14,19. It has also been found that up to 16% of patients in psychiatric care meet the DSM-IV criteria for BDD20. The prevalence of this disorder in patients seeking dermatological care may reach as high as 14%21. Although most authors have reported prevalences of BDD between 6% and 15%16,17,22 among cosmetic surgery patients, other authors found higher prevalences ranging from 16% to 24%18,23-25,and up to 53%6. BDD is often unrecognized or misdiagnosed in mental health settings20 and therefore merits further research in these and other settings. Moreover, due to the high prevalence of comorbid psychiatric disorders in BDD patients and non-psychiatric treatment-seeking behavior in dermatology and cosmetic surgery patients, it is important that dermatologists and cosmetic surgeons be educated to recognize the clinical signs of BDD to allow appropriate screening and care of patients. Individuals with BDD often do not seek cosmetic or mental treatment at the beginning of their dissatisfaction with appearance13,16. BDD patients usually have comorbid psychiatric disorders, which show the heterogeneous nature of this condition. Moreover, comorbid conditions may aggravate the level of patient distress10,15,20. The onset of BDD symptoms usually occurs during childhood and adolescence, a period in which people are particularly concerned about their appearance, and after menopause13,26. Although Phillips et al.27 described this aspect as characteristic of its chronic course, in another study, Phillips et al.9 reported that BDD could occur in adulthood and that, although it is also present in the elderly, few studies on this age group are currently available. In some cases, BDD symptoms may appear late in life, often following a traumatic event28. Thus, it is important to screen for BDD in patients requesting any type of cosmetic surgery, as this disorder may occur in individuals of all ages and at different stages of body image development. There are more similarities than differences between youth and adults9,17,28. However, symptom severity tends to be higher in young people and associated with substance abuse, self-destructive behaviors, suicidal ideation, and suicide attempt, resulting in increased morbidity19. Therefore, BDD treatment is important in preventing the dramatic and long-lasting effects of the disorder on individuals. BDD symptoms are similar across a wide range of clinical features in both genders9, showing that the manifestations and specific characteristics of BDD for each gender do not seem to change its diagnostic criteria. Although any region of the body may be the focus of excessive preoccupation and distress in patients with BDD, the areas of body dissatisfaction differ between men and women17,29. Women tend to have higher body dissatisfaction and more severe symptoms of BDD than men27. This suggests that women are more influenced by social and cultural factors and more likely to invest in their appearance. On the other hand, this may indicate that sociocultural factors may have a marked effect on individuals predisposed to this condition. Besides differences in areas of body dissatisfaction, Vindigni et al.6 reported differences in comorbid psychiatric disorders between genders in BDD patients. Individuals with BDD frequently seek cosmetic surgery to correct perceived defects and reduce the extreme dissatisfaction with their physical appearance22. The lack of awareness of the morbid state of their mind may lead individuals to a delusional state9. This may explain the dissatisfaction of many BDD patients with the outcome of surgical procedures and their frequent requests for additional surgeries. These patients are also referred to as insatiable surgery patients, psychologically disturbed patients, polysurgery addicts, and rhinoplasty patients with psychiatric syndrome11,30. Nevertheless, cosmetic surgery may be one of the recommended treatments for some of these patients, especially for those with mild symptoms of BDD7,18,31,32. This new perspective reveals shortcomings in psychiatric studies based on retrospective data with bias in patient selection, which may interfere with the diagnosis and treatment of the disorder31,33. In a study with 29 rhinoplasty patients, Veale et al.18 reported that20.7% of them met criteria for BDD, and that patients with sub-clinical or very mild BDD symptoms might show satisfaction with the surgical outcome. Tignol et al.34 compared cosmetic surgery patients with (n=7) and without BDD (n=8) and found that although outcome satisfaction was high in both groups, 6 patients in the BDD group still met criteria for this condition 5 years after surgery and presented higher levels of handicap and psychiatric comorbidity than those in the non-BDD group. These studies indicate that further prospective studies on the identification of BDD and development of treatment strategies are necessary. Studies on the prevalence of BDD among cosmetic surgery patients are uncommon. 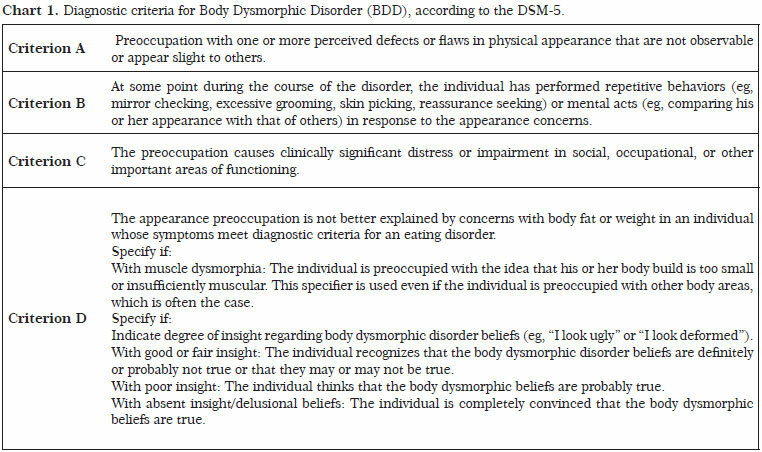 This may be attributed to diagnostic difficulties3,22 related to the indistinct transition between the three DSM-IV DSM-5 diagnostic criteria for BDD (Chart 1)9,35 that characterize the clinical symptoms of this disorder and the essential motivation of patients to undergo cosmetic surgery due to dissatisfaction with physical appearance. The DSM-5 criterion A describes most individuals seeking cosmetic surgery; it addresses the excessive preoccupation of patients with perceived defects or flaws in the physical appearance9. The DSM-5 criterion B and C addresses subjective distress and avoidance behaviors associated with dissatisfaction with body image, particularly with a specific part of the body36. The levels of anxiety and distress may vary, affecting the quality of life of each individual in different ways. Therefore, the DSM-5 criterion C may be considered the most important criterion for the assessment of cosmetic surgery patients3. Degrees of behavior impairment and emotional distress seem to be more accurate indicators of BDD in cosmetic surgery patients, regardless of the severity of the physical appearance3. The use of the criterion C to identify BDD patients exerts a significant impact on the prevalence of this condition, as body image dissatisfaction and appearance-related concerns are a common and normal feature in the general population9. The DSM-5 criterion D includes concerns about weight, body shape, and feelings of inadequacy in relation to gender identity in patients who do not meet diagnostic criteria for, e.g., anorexia nervosa or gender dysphoria9, showing that there are similarities and an ill-defined boundary between symptoms. The expression of body dissatisfaction today may be more often associated with concerns about body weight and shape than with classic BDD complaints, where dissatisfaction is usually not typically expressed in terms of body weight and shape preoccupation35-37. Individuals with BDD may show appropriate social behavior and discourse in the doctor's presence if medical history is taken in a brief and vague manner. Interviews are important to determine the existence of excessive concern with minor flaws or whether the perceived defects in appearance are nonexistent (not observable by others); whether preoccupation with weight is a symptom of BDD or an eating disorder; and whether the degree of distress resulting from a concern with appearance is clinically significant. Moreover, the identification of specific characteristics, such as suicide risk, poor insight, and presence of alexithymia (difficulty in identifying and describing their feelings) may be a better way to detect BDD in order to optimize care and treatment strategies. The signs and symptoms that indicate the presence or risk of BDD and may help surgeons in the decision-making process in the selection of patients for cosmetic surgery are listed in Chart 2. It is recommended that a therapeutic bond be established between doctor and patient. Patients should be encouraged to talk about the reasons that led them to seek cosmetic surgery. Patients should also be encouraged to use their own words in addressing and describing a perceived defect. Patients who can articulate their problems realistically and describe their motivations and expectations likely do not have BDD. Therefore, measures of levels of motivation and expectation, and evaluation of the patient's ability to judge quality of treatment outcome may contribute to the screening of patients and prediction of patient satisfaction with cosmetic surgery procedures. Frequent cancellation or rescheduling of appointments, demands for consultation, phone calls outside office hours, or refusal to speak are common behaviors in BDD patients. Moreover, it is important to be aware that psychiatric patients are likely to arouse strong emotional responses in their physicians. Although effective treatments are available either specifically for BDD or comorbid symptoms, there are a number of obstacles to their effective delivery. Many people with BDD have depression, which makes them unmotivated to work toward recovery38. Other patients do not understand that the degree of body dissatisfaction is related to a distorted body image6 and seek cosmetic procedures as an alternative to psychological treatment7. Many are housebound and have extreme social phobia, or are too anxious, embarrassed, or ashamed to seek treatment and talk to a therapist38. Additionally, subclinical symptoms (i.e., symptoms that do not meet all criteria for BDD or conditions in which the "core" symptoms of BDD are present but do not cause a significant impairment in overall functioning) make the identification and diagnosis of the disorder difficult. 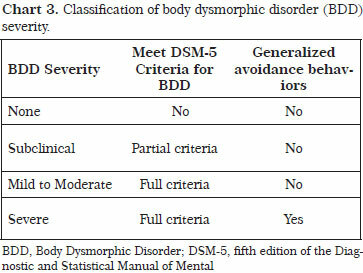 Doctors need to know how to identify BDD symptoms and distinguish them from similar symptoms of other disorders, which shows the importance of using disorder-specific measures in the screening process, such as the Body Dysmorphic Disorder Examination (BDDE)39 and the Yale Brown Obsessive Compulsive Scale Modified for Body Dysmorphic Disorder (BDD-YBOCS)40. Furthermore, BDD is often misunderstood by therapists and finding an effective treatment can therefore be challenging9,38. Thus, if on the one hand the level of distress is a motivating factor for seeking surgical or mental health treatment in BDD patients, on the other hand such distress can also affect their level of perception and their adherence to treatment. Although these patients are difficult to treat, BDD is a treatable condition17. Therefore, a broader diagnosis allows the investigation of heterogeneous disorders and a more precise determination of clinical differences between patients, while facilitating the identification of risk factors and development of more effective treatments, which may include surgical treatment7. According to our clinical practice experience, the presence of BDD is not an exclusion criterion for cosmetic surgery7, and some patients with BDD may benefit from cosmetic procedures31,32. Diagnostic instruments and the classification of BDD severity (Chart 3) may provide information to assist surgeons when deciding whether or not to operate. Patients with subclinical BDD symptoms do not meet all DSM-5 criteria for BDD or present "core" BDD symptoms but no significant impairment in overall functioning; these patients may undergo cosmetic and surgical treatments. However, patients who meet all DSM-5 criteria for BDD and show avoidance behaviors, including avoidance of public and social situations, physical contact, and physical activities due to self-consciousness about appearance, should not undergo cosmetic and surgical treatments, but instead be referred to psychological and pharmacological treatments. After a period of treatment, some patients may be reassessed for BDD severity under the supervision of mental health professionals and referred to cosmetic and surgical treatments if their condition improved31.The assessment of BDD patients requires the plastic surgeon to be knowledgeable about the psychopathology of BDD and able to identify BDD signs and symptoms. The use of the classification of BDD severity in the screening of cosmetic surgery candidates may reduce the number of patients showing BDD symptoms in the postoperative period. Two questions addressing age at onset of BDD symptoms and time (hours/day) spent worrying about physical appearance may be included to the BDD assessment. The early onset of symptoms is associated with increased severity of psychopathology and the amount of time spent worrying about appearance is linked to the level of body image concerns and body dissatisfaction9,18. Severe BDD symptoms may be associated with negative delusional beliefs about one's appearance and avoidance behaviors (camouflaging and social withdrawal)36. The treatment for BDD will likely include a combination of therapies. According to a treatment practice guideline from the United Kingdom's National Institute for Health and Clinical Excellence (NICE) and a recent study in the literature, cognitive-behavioral therapy (CBT) and pharmacotherapy based on selective serotonin reuptake inhibitors (SSRIs) are recommended as first-line treatments for BDD42. The fundamental characteristic of BDD is the negative emotional response to the visual perception of body parts, which the individual believes to be deformed. The negative impact on psychosocial functioning associated with reduced quality of life and a high suicide rate are part of the clinical picture7,15. An excessive level of investment in appearance and importance attached to body image are characteristic behaviors of BDD patients. However, to meet the diagnostic criteria for BDD, individuals must not only make a substantial investment in their appearance, but also exhibit a negative body-image evaluation combined with extreme distress. The most common emotional responses toward physical appearance are shame, disgust, anger, and anxiety. Thus, individuals with BDD are constantly troubled by the inability to meet their own aesthetic standards. For these individuals, the determining factor and potential source of appearance disorder seems to be related to the discrepancy between self-perception of attractiveness and their ideal appearance standard. Actually, BDD patients are more concerned with what they are not and what they could be in terms of appearance, revealing that aesthetic ideals are not consistent with expectations regarding the concept of beauty. Thus, they are led by a beauty ideal and perceived ugliness to compare themselves with others and seek reassurance of the perceived defect. Individuals with BDD may feel attractive, but not beautiful in the idealized manner. Therefore, although these patients perceive improvement after a cosmetic surgery, they are never satisfied despite the objective result. The belief that "there is always room for improvement" can cause in these individuals an addictive behavior expressed in a relentless search for cosmetic and surgical procedures. Moreover, satisfaction with the surgical outcome may be transient as some of these patients elect a different body region or another compulsive behavior, such as alcohol or cannabis use, as a focus of excessive attention and concern34. This fact essentially shows that the main characteristic of these patients is body dissatisfaction, which may not be linked to the outcome of a cosmetic procedure7. BDD patients exhibit a need for perfection and their thoughts and behaviors are based on perfectionism. This explains their excessive concern, as well as distress with perceived flaws in appearance. Furthermore, these individuals frequently show the need to meet a standard9. Some are not concerned with the defect itself, but rather with one or more features that are not perfect, correct, symmetrical, or harmonious with their body or personality43,44. In severe cases of BDD, patients have vague complaints, such as being ugly18. The fact that perfectionism is related to a number of other mental disorders, including depression, anorexia, obsessive-compulsive disorder (OCD), and social phobia, supports the idea that perfectionism is associated with psychopathology45. A pattern of neurocognitive deficits (obsessive thoughts and compulsive behaviors) may reveal symptoms of BDD and define the clinical profile of a given population. Cognitive deficits, including deficits in executive, memory, and social functions affect visual and selective information processing. Individuals with BDD have biased attention, interpretation of situations, and recognition of facial emotions, and show psychological vulnerability and low self-esteem19. These individuals exhibit emotional bias and the memory of an image can be distorted. However, this is not attributed to a distorted perception28. BDD patients have a higher accuracy in the aesthetic evaluation of harmony/symmetry and enhanced perceptual, emotional, and evaluation sensitivity to changes in appearance. These patients focus on specific features that they consider ugly, ignoring more attractive features. This may explain why some patients overlook defects visible to others and address other defect, pointing out features typical of BDD perception28. Individuals with BDD are unable to see the "bigger picture" as they are over-focus on small details15. This neural dynamics seems to have an impact on thinking and overall perception, which in individuals with BDD appears fragmented, affecting their level of insight. Thus, a focused attention and negative self-evaluation, always associated with physical appearance, as well as impaired recognition of facial and emotional expressions further enhance their self-referenced ideas36, such as "People talk about me and avoid me because I am ugly." This dynamic may lead to feelings and manifestations of aggression. The level of concern can be estimated by the time patients spent on their appearance; it affects the perception of the physical defect, which is overestimated in BDD patients. The level of concern is considered excessive when the time spent on appearance exceeds three hours daily9,44. Therefore, unsuitable strategies for dealing with thoughts and emotions reflect their body-image investment, body-image evaluation, or excessive importance to appearance. Patients respond to extreme concern and anxiety over physical appearance with checking behaviors, such as comparing themselves with others, seeking reassurance regarding the perceived defect, inspecting body parts, and looking in mirrors. They may also respond with avoidance behaviors, including mirror checking, concealment/camouflaging, or changes in posture to hide or divert attention from the perceived defect in social and public situations and during physical contact or outdoor activities. All these behaviors substantially affect the quality of life of BDD patients; they are defense mechanisms that attempt to provide and assure confidence to the patient in a phobic and dysfunctional manner. On the other hand, these behaviors may be a way found by patients with less severe BDD symptoms to adapt to the environment44. Checking behaviors are exceedingly numerous and occur in a ritual context. This type of behavior reflects an attempt by individuals to assess certain aspects of their appearance and may show differences between the genders29. Camouflage strategies will vary depending on the body region with which the individual is dissatisfied. Thus, it may involve the color and style of clothing, the wearing of accessories, such as carrying a handbag to hide the abdominal region, or the use of makeup, tanning, sunglasses, surgical mask, changes of clothes throughout the day, not wearing prescription glasses, as well as the use of tattoos or piercing (to divert attention from the size or shape of the nose), hair styles that hide the perceived defect, or the use of a hat or cap by women. In attempting to hide the perceived defect, patients seeking facial cosmetic procedures may show changes in body posture, including keeping the head low, showing inhibition, gesticulating, being extremely concerned with showing their best angle, or even avoiding smiling. BDD patients usually refuse to have their picture taken, showing with such behavior that they reject their image. Avoidance strategies such as camouflaging are important indicators of the level of concern with appearance of individuals with BDD. In BDD patients, impulsive traits may lead to increased levels of health-risk behaviors, including aggressiveness, self-destructiveness associated with substance abuse, eating disorders, obsessive desire to undergo cosmetic procedures, indebtedness, repeated hospitalizations, suicidal ideation, and fatal and non-fatal suicide attempts46. Patients with BDD are a high-risk population, which is susceptible to self-destructive behaviors, such as skin picking and trichotillomania, and exhibit high suicidal ideation (80%) and suicide attempt rates (24%)22,47. These behaviors reveal the extreme distress associated with BDD and support the hypothesis that the level of distress may be characterized as a risk factor and used as a measure of BDD severity in these individuals. Some impulsive behaviors (e.g., the compulsive buying of clothes or beauty products, working out, seeking for a variety of cosmetic procedures, and the use of cannabis and alcohol) present in BDD patients attempt to divert attention and concern from their own appearance. The level of avoidance behavior may reveal the level of concern in these patients and characterize a dysfunctional adaptation strategy. Moreover, behaviors such as skin picking and trichotillomania are associated with attempts to improve appearance18. Skin picking behavior may be motivated by tactile sensations of burning, pain, and swelling associated with the level of patient distress with appearance28. The search for dermatological procedures may be related to skin picking behaviors28. Extreme behaviors, such as "do-it-yourself" (DIY) cosmetic procedures, consist of severe self-inflicted procedures performed in an attempt to correct a perceived defect18,46. Like skin picking, DIY cosmetic procedures may be observed in severe cases of BDD and may include the use of superglue (cyanoacrylate), tape, and clothespins to try to make the nose thinner, attempts to perform surgery on themselves, and overexposure of the body to different types of natural and artificial tanning. These behaviors may also be considered self-destructive due to the degree of physical suffering inflicted to the body. Similar types of behaviors featuring deliberate self-mutilation were described by Chan et al.48. Although the goal is usually the same, the ways in which these individuals intervene in the body may vary and show different degrees of severity. The fact remains that in the end these patients require dermatological treatment or surgical correction, which become for some the main purpose of their self-damaging behavior. Individuals who seek cosmetic surgery commonly show psychiatric disorders, including BDD, narcissistic personality disorder, and histrionic personality disorder5,17. Morselli49 observed that 75% of patients undergoing cosmetic surgery had a DSM-IV psychiatric diagnosis preoperatively. The most common disorders were generalized anxiety disorder (45.7%), OCD (34.9%), social phobia (33.7%), BDD (29%), eating disorder not otherwise specified (25.3%), major depression (22.9%), posttraumatic stress disorder (13.2%), and substance use disorder (8.4%). Cluster B personality disorders included borderline personality disorder (10.8%), antisocial personality disorder (6%), narcissistic personality disorder (8.4%), and histrionic personality disorder (3.6%). Cluster C personality disorders included obsessive-compulsive personality disorder (13.2%), avoidant personality disorder (4.8%), and dependent personality disorder (3.6%)49. Analysis of comorbidities may reveal the nature of the relationship between various mental disorders as a risk factor for the development of BDD. Mood and anxiety disorders are often comorbid with BDD6,22,50. The most prevalent lifetime comorbid disorders in BDD patients are major depression (82%), social phobia (37-40%), OCD (30%), and abuse of alcohol and other drugs (36%)13,44. Malick et al.17 reported delusional disorder, somatic type, anorexia nervosa, and gender identity disorder as BDD comorbid disorders. Vindigni et al.6 observed that the most prevalent comorbid Axis I disorders in BDD patients are dysthymia (60%), social phobia (60%), and posttraumatic stress disorder (4%) for men, and major depressive episode (24%), social phobia (20%), and generalized anxiety disorder (20%) for women. In addition, Fenwick and Sullivan51 found a high level of comorbidity between BDD and eating disorders. Ruffolo et al.52 observed changes in the primary diagnosis between BDD and eating disorders, and noted that clinical symptoms and areas of body dissatisfaction sometimes overlap (e.g., size of the upper abdomen, hips, and thighs). More recently, studies have indicated the association and symptom overlap of BDD with anorexia nervosa, bulimia nervosa, and non-specific eating disorders37,38,52. Ende et al.44 called the attention for some disorders that fall in between. Trichotillomania for example can be a symptom for BDD or OCD, depending on the specific context. In BDD, pulling out the hair does not reduce stress, and patients must find other means to alleviate their anxiety44.Moreover, BDD as a secondary symptom may increase the severity of the primary disorder. Patients with BDD have higher rates of depression, anxiety, and suicide than those who are not diagnosed as BDD50,52. The rate of personality disorders among individuals with BDD is relatively high22. Fifty percent of individuals with BDD have comorbid personality disorders17,38. BDD is common in patients with borderline personality disorder, which is characterized by impulsivity and aggressive behavior6,23,28. The presence of personality disorders may enhance the severity of BDD symptoms and may be associated with BDD symptom development23. Personality disorders also affect the level of expectation and behavior of patients seeking cosmetic surgery in terms of their relationship with the medical team, as well as in terms of their satisfaction with treatment outcome. Narcissistic, dependent, and borderline personality disorders are the most common in individuals who seek cosmetic surgery. A study on patients seeking cosmetic surgery reported that narcissistic personality disorder (characterized by features of grandiosity, need for admiration, and lack of empathy) was observed in 25% of patients, while dependent personality (characterized by invasive behavior and need for attention) was observed in 12% 53. Patients with narcissistic personality disorder tend to believe that attractiveness is associated with youth and try to recreate this image. But despite their dissatisfaction with the treatment outcome, patients with narcissistic personality insist on additional treatments17. Histrionic personality disorder has a pattern of excessive emotionality and attention-seeking behavior. Patients with this disorder exhibit unrealistic expectations and may be dissatisfied with treatment outcomes. Histrionic personality disorder was observed in 9.7% of individuals seeking cosmetic surgery, followed by borderline personality (9%), OCD (4%), schizoid (1.5%) and paranoid personality (0.75%)53. These findings are similar to those of a recent study49. There is no known way to prevent BDD. However, the early diagnosis and treatment after the onset of BDD symptoms might be helpful. Teaching and encouraging healthy and realistic attitudes about body image also might help prevent the development or worsening of BDD symptoms. Also, an understanding and supportive environment might well serve to reduce symptom severity and help a person with BDD better cope with the disorder. 1. Sarwer DB, Crerand CE. Body image and cosmetic medical treatments. Body Image. 2004;1(1):99-111. 2. De Brito MJ, Nahas FX, Barbosa MV, Dini GM, Kimura AK, Farah AB, et al. Abdominoplasty and its effect on body image, self-esteem, and mental health. Ann Plast Surg. 2010;65(1):5-10. 3. Sarwer DB, Crerand CE. Body dysmorphic disorder and appearance enhancing medical treatments. Body Image. 2008;5(1):50-8. 4. da Silva DB, Nahas FX, Bussolaro RA, de Brito MJ, Ferreira LM. The Increasing Growth of Plastic Surgery Lawsuits in Brazil. Aesthetic Plast Surg. 2010;34(4):541-2. 5. Shridharani SM, Magarakis M, Manson PN, Rodriguez ED. Psychology of plastic and reconstructive surgery: a systematic clinical review. Plast Reconstr Surg. 2010;126(6):2243-51. 6. Vindigni V, Pavan C, Semenzin M, Granà S, Gambaro F, Marini M, et al. The importance of recognizing body dysmorphic disorder in cosmetic surgery patients: do our patients need a preoperative psychiatric evaluation? Eur J Plast Surg. 2002;25(6):305-8. 7. de Brito MJ, Nahas FX, Ferreira LM. Should plastic surgeons operate on patients diagnosed with body dysmorphic disorder? Plast Reconstr Surg. 2012;129(2):406e-7e. 8. Morselli E, Jerome L. Dysmorphophobia and taphephobia: two hitherto undescribed forms of insanity with fixed ideas. Hist Psych. 2001;12(45):107-14. 9. Phillips KA, Wilhelm S, Koran LM, Didie ER, Fallon BA, Feusner J, et al. Body dysmorphic disorder: some key issues for DSM-V. Depress Anxiety. 2010;27(6):573-91. 10. Fontenelle LF, Telles LL, Nazar BP, de Menezes GB, do Nascimento AL, Mendlowicz MV, et al. A sociodemographic, phenomenological, and long-term follow-up study of patients with body dysmorphic disorder in Brazil. Int J Psychiatry Med. 2006;36(2):243-59. 11. Knorr NJ, Edgerton MT, Hoopes JE. The "insatiable" cosmetic surgery patient. Plast Reconstr Surg. 1967;40(3):285-9. 12. Hay GG. Dysmorphophobia. Br J Psychiatry. 1970;116(533):399-406. 13. Pavan C, Simonato P, Marini M, Mazzoleni F, Pavan L, Vindigni V. Psychopathologic aspects of body dysmorphic disorder: a literature review. Aesthetic Plast Surg. 2008;32(2):473-84. 14. Cansever A, Uzun O, Dönmez E, Ozşahin A. The prevalence and clinical features of body dysmorphic disorder in college students: a study in a Turkish sample. Compr Psychiatry. 2003;44(1):60-4. 16. Aouizerate B, Pujol H, Grabot D, Faytout M, Suire K, Braud C, et al. Body dysmorphic disorder in a sample of cosmetic surgery applicants. Eur Psychiatry. 2003;18(7):365-8. 17. Malick F, Howard J, Koo J. Understanding the psychology of the cosmetic patients. Dermatol Ther. 2008;21(1):47-53. 18. Veale D, De Haro L, Lambrou C. Cosmetic rhinoplasty in body dysmorphic disorder. Br J Plast Surg. 2003;56(6):546-51. 19. Buhlmann U, Glaesmer H, Mewes R, Fama JM, Wilhelm S, Brähler E, et al. Updates on the prevalence of body dysmorphic disorder: a population-based survey. Psychiatry Res. 2010;178(1):171-5. 20. Grant JE, Kim SW, Crow SJ. Prevalence and clinical features of body dysmorphic disorder in adolescent and adult psychiatric inpatients. J Clin Psychiatry. 2001;62(7):517-22. 21. Pollice R, Giuliani M, Bianchini V, Zoccali G, Tomassini A, Casacchia M, et al. Body image disorders and other psychiatric symptoms in aesthetic plastic surgery. Ann Ital Chir. 2009;80(1):49-54. 22. Crerand CE, Franklin ME, Sarwer DB. Body dysmorphic disorder and cosmetic surgery. Plast Reconstr Surg. 2006;118(7):167e-80e. 23. Bellino S, Zizza M, Paradiso E, Rivarossa A, Fulcheri M, Bogetto F. Dysmorphic concern symptoms and personality disorders: a clinical investigation in patients seeking cosmetic surgery. Psychiatry Res. 2006;144(1):73-8. 24. Alavi M, Kalafi Y, Dehbozorgi GR, Javadpour A. Body dysmorphic disorder and other psychiatric morbidity in aesthetic rhinoplasty candidates. J Plast Reconstr Aesthet Surg. 2011;64(6):738-41. 25. PicavetVA, Gabriëls L, Grietens J, Jorissen M, Prokopakis EP, Hellings PW. Preoperative symptoms of body dysmorphic disorder determine postoperative satisfaction and quality of life in esthetic rhinoplasty.Plast Reconstr Surg. 2012. 26. Bjornsson AS, Didie ER, Phillips KA. Body Dysmorphic Disorde. Dialogues Clin Neurosci. 2012;12:221-32. 27. Phillips KA, Menard W, Fay C. Gender similarities and differences in 200 individuals with body dysmorphic disorder. Compr Psychiatry. 2006;47(2):77-87. 28. Veale D, Neziroglu F. Body dysmorphic disorder. A treatment manual. West Suissx: Wiley-Blackwell; 2010. 29. Alfano L, Hildebrandt T, Bannon K, Walker C, Walton KE. The impact of gender on the assessment of body checking behavior. Body Image. 2011;8(1):20-5. 30. Goin MK, Goin JM. Psychological effects of aesthetic facial surgery. Adv Psychosom Med. 1986;15:84-108. 31.	de Brito MJ, Nahas FX, Ferreira LM. Replay: Should plastic surgeons operate on patients diagnosed with body dysmorphic disorder (BDD)? Plast Reconstr Surg. 2012;130(4):622e. 32. Felix GA, de Brito MJ, Nahas FX, Tavares H, Cordás TA, Dini GM, et al. Patients with mild to moderate body dysmorphic disorder may benefit from rhinoplasty. J Plast Reconstr Aesth Surg. 2014;67(5):646-54. 33. Altamura C, Paluello MM, Mundo E, Medda S, Mannu P. Clinical and subclinical body dysmorphic disorder. Eur Arch Psychiatry Clin Neurosci. 2001;251(3):105-8. 34. Tignol J, Biraben-Gotzamanis L, Martin-Guehl C, Grabot D, Aouizerate B. Body dysmorphic disorder and cosmetic surgery: evolution of 24 subjects with a minimal defect in appearance 5 years after their request for cosmetic surgery. Eur Psychiatry. 2007;22(8):520-4. 35. American Psychiatric Association. Obsessive-Compulsive and Related Disorders. In: Diagnostic and Statistical Manual of Mental Disorders, Fifth Edition. Arlington, VA: American Psychiatric Association; 2013. p. 235-64. 36. Gabbay V, Asnis GM, Bello JA, Alonso CM, Serras SJ, O'Dowd MA. New onset of body dysmorphic disorder following frontotemporal lesion. Neurology. 2003;61(1):123-5. 37. Dingemans AE, van Rood YR, de Groot I, van Furth EF. 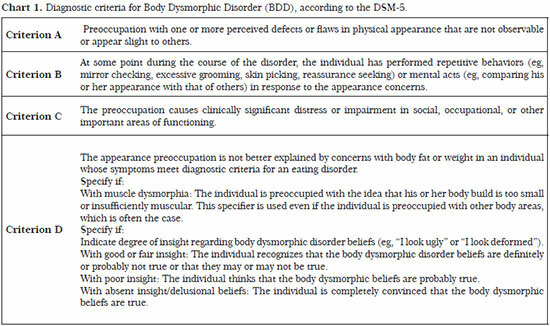 Body Dysmorphic Disorder in Patients with an Eating Disorder: Prevalence and Characteristics. Int J Eat Disord 2012;45(4):562-9. 38. Ross J, Gowers S. Body Dysmorphic Disorder. Adv Psychiatr Treat.2011;17:142-9. 39. Jorge RT, Sabino Neto M, Natour J, Veiga DF, Jones A, Ferreira LM. Brazilian version of the body dysmorphic disorder examination. Sao Paulo Med J. 2008;126(2):87-95. 40. Phillips KA, Hollander E, Rasmussen SA, Aronowitz BR, DeCaria C, Goodman WK. A severity rating scale for body dysmorphic disorder: development, reliability, and validity of a modified version of the Yale-Brown Obsessive Compulsive Scale. Psychopharmacol Bull. 1997;33(1):17-22. 41. National Collaborating Centre for Mental Health. Obsessive-compulsive disorder: Core interventions in the treatment of obsessive-compulsive disorder and body dysmorphic disorder. National Clinical Practice Guideline Number 31. National Institute for Health and Clinical Excellence, National Health Service, 2006. Available from: http://www.nice.org.uk/nicemedia/live/10976/29948/29948.pdf. Accessed November 21, 2012. 42. Phillips KA, Rogers J. Cognitive-behavioral therapy for youth with body dysmorphic disorder: current status and future directions. Child Adolesc Psychiatric Clin N Am. 2011;20(2):287-304. 43. Reese HE, McNally RJ, Wilhelm S. Facial asymmetry detection in patients with body dysmorphic disorder. Behav Res Ther. 2010;48(9):936-40. 44. Ende KH, Lewis DL, Kabaker SS. Body dysmorphic disorder. Facial Plast Surg Clin North Am. 2008;16(2):217-23. 45. Buhlmann U, Etcoff NL, Wilhelm S. Facial attractiveness ratings and perfectionism in body dysmorphic disorder and obsessive-compulsive disorder. J Anxiety Disord. 2008;22(3):540-7. 46. Jakubietz M, Jakubietz RJ, Kloss DF, Gruenert JJ. Body dysmorphic disorder: diagnosis and approach. Plast Reconstr Surg. 2007;119(6):1924-30. 47. Reese HE, McNally RJ, Wilhelm S. Reality monitoring in patients with body dysmorphic disorder. Behav Ther. 2011;42(3):387-98. 48. Chan JK, Jones SM, Heywood AJ. Body dysmorphia, self-mutilation and the reconstructive surgeon. J Plast Reconstr Aesthet Surg. 2011;64(1):4-8. 49. Morselli PG. Maxwell Maltz, psychocybernetic plastic surgeon, and personal reflections on dysmorphopathology. Aesth Plast Surg. 2008;32(3):485-95. 50. Fang A, Hofmann SG. Relationship between social anxiety disorder and body dysmorphic disorder. Clin Psychol Rev. 2010;30(8):1040-8. 51. Fenwick AS, Sullivan KA. Potential link between body dysmorphic disorder symptoms and alexithymia in an eating-disordered treatment-seeking sample. Psychiatry Res. 2011;189(2):299-304. 52. Ruffolo JS, Phillips KA, Menard W, Fay C, Weisberg RB. Comorbidity of body dysmorphic disorder and eating disorders: severity of psychopathology and body image disturbance. Int J Eat Disord. 2006;39(1):11-9. 53. Napoleon A. The presentation of personalities in plastic surgery. Ann Plast Surg. 1993;31(3):193-208. Instituition: Division of Plastic Surgery, Department of Surgery, Universidade Federal de São Paulo - UNIFESP. Article submitted: April 2, 2013. Article accepted: April 14, 2013.